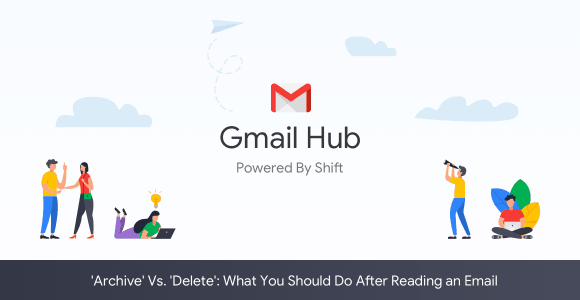 While using Shift makes shifting between multiple email accounts and other Google services effortless, when it comes to Gmail some users still have issues in determining archive vs delete. What happens when you ‘archive’ an email? You can archive emails in Gmail or choose to delete them when cleaning up your inbox. Archived emails are easily accessible go to ‘All Mail.’ But, what is the difference between archiving emails versus deleting them within Gmail? To archive your emails, select the emails you want archived using the checkboxes on the left side, then click on the Archive option on your Gmail toolbar. You can then find the email when you go to ‘All Mail’ tab. You can even choose to put the email back into your inbox by clicking on the ‘Move to Inbox’ option. Archiving allows you to organize your inbox by moving messages from your inbox into your archive. Archiving is an excellent option if you are not sure if you will need an email again in the future. It is like you are filing it away for future reference. A significant aspect to this feature is that if someone responds to an email you have archived, the conversation will then reappear in your inbox automatically. What happens when you ‘delete’ an email? To delete an email in Gmail on your computer, it is quite simple. Simply check the box to the left of the emails you want to delete then click the trashcan icon at the top of the page. You will only want to use the delete feature for emails that you want to get rid forever. In Gmail, the deleted emails are saved for 30 days in case you delete something by mistake. You can always empty your trash folder whenever you want; however, those emails will then be gone immediately and no longer retrievable.